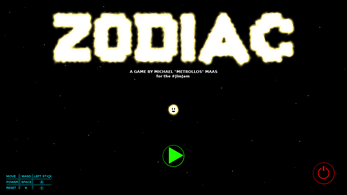 What kind of game is Zodiac? Zodiac is a little puzzle game, made in 48h for the #JimJam. Your objective is to bring all sparks to the goal to form a star. The clue is, that you control every spark at the same time. Where comes the insperation from? When the theme was announced, I had no idea at first. I went to my window and watched the night sky. I saw some planes what reminded me to my days as a litte child. Back then I thought this moving "stars" are these, who are to late and have to go to their places. This memory inspired me to make this game. Which parts of the game are not made by yourself? All sound effects and music in the game, which are not listed above, are made with FLStudio and free presets for the synthesizers. All sprites are made with GIMP 2 and completely "hand drawn" by myself. This game does not leave any save files etc. on your computer, if you delete it.